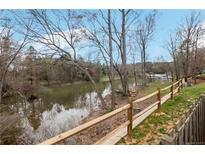 Below you can view all the condos for sale in the Lake Wylie Woods subdivision located in Lake Wylie North Carolina. Listings in Lake Wylie Woods are updated daily from data we receive from the Charlotte multiple listing service. To learn more about any of these condos or to receive custom notifications when a new property is listed for sale in Lake Wylie Woods, give us a call at 704-966-7965. Award Winning Schools! Low SC Taxes! MLS#3498012. Miller Realty Group. Convenient to shopping/dining. Tenant occupied - month to month. MLS#3488265. Miller Realty Group. for it's residence. Priced to Sell! MLS#3489045. Allen Tate Ballantyne. The master bathroom is a designer's dream with sleek his and her sinks, vanity lighting and on-trend tiling in the shower that can also be used as a steam room. MLS#3480902. Keller Williams Ballantyne Area. There is a $395.00 - HOA Buyer Transfer Fee. MLS#3456856. Henderson Realty.